On the other hand, the enterprise architecture teams have nice toys and methodologies to document landscapes, analyze requirements and map the required changes as demanded by current projects. Which SAP objects with custom modifications are used (to reduce risks during an upgrade)? What interfaces are used by applications and SAP clients to set up monitoring? Which master data is used by which SAP processes to optimize our master data management (MDM)? Are there application services available to be published in the Enterprise Service Repository for SAP BPM implementations? Here the ArchiMate® modeling language from The Open Group, frequently used side by side with their TOGAF® methodology, is the right choice. 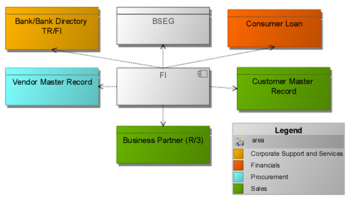 It offers a good and easy way to understand the enterprise architecture based on SAP landscapes. Together with the team of BiZZdesign we have developed a mapping of the SAP meta-model to the ArchiMate’s one in order to populate the business, application and infrastructure layers in next real time with essential architecture data. 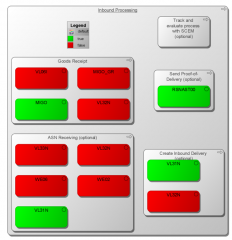 This provides a valuable sandbox for enterprise architects to visually navigate the corresponding inventories and relationships using the BiZZdesign Architect tool. By this comprehensive view at the whole landscape, architects can easily analyze and simulate changes for more agility in support of business processes. The following figure shows an automatically generated viewpoint about master data usage. This is very helpful for the next upcoming MDM projects. 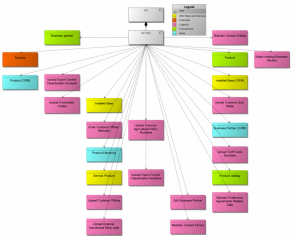 Symbol coloring is used to highlight relationships of master data types to SAP modules. Drilling down to a more detailed view of SAP application components shows the complexity of master data usage. Wouldn’t it be worth fully to understand who uses which data and who has to manage it? By linking the system landscape directory of business blueprints into SAP® Solution Manager the following SAP capability maps can be used to build ArchiMate’s business. Again, symbol coloring can highlight the usage of standard SAP transactions or for instance customized (Z-) transactions. Particularly for SOA projects it is important to identify the value of a landscape to leverage existing services at the enterprise level. The transparency created with this solution helps for instance to find interfaces like RFC, IDocs, BAPI or web services. All of these entities are scanned to reveal the complexity of application relationships for a better hub-and spoke architecture; and this is quite essential when you are using BPM for process execution. But before I am looking to the bright horizon of new technologies, I need to know where I am – and here enterprise architecture definitely helps to locate my position for better planning of the (needed) change for more agility.